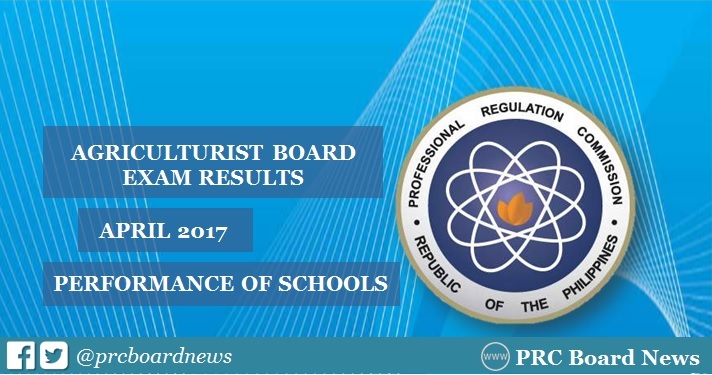 MANILA, Philippines - The Professional Regulation Commission (PRC) announces the full results of April 2017 Agriculturist board exam which include the list of top performing schools and matrix of performance of schools in few working days after the exam. PRC officially released results today, May 5, 2017 or in 4 working days after the exam. A total of 927 out of 2,938 (31.55%) passed the exam. The examination was conducted on April 25, 26 and 27 in the cities of Manila and all Regional Offices including Zamboanga. In the October 2016 Agriculturist licensure exam, PRC hailed University of the Philippines - Los Baños (UPLB) as the lone top performing school for having 96.83% passing rate or 122 out of 126 passed the test. UPLB also topped the 2015 and 2014 examinations, 98.61 % (71 out of 72) and 98.78 % (81 out of 82), respectively.